Alpha GPC 300mg 60 tab. Take one tablet one to two times per day with water. Proper Alpha-GPC dosage depends on many different factors, so it should be adjusted individually. Alpha-GPC is usually used as a nootropic improving cognitive functions and memory. For this purpose, it is recommended to supplement with 400-1000 mg of alpha-GPC a day. In order to maintain stable levels of the compound in brain cells, the dosage should be split into two or three equal servings. 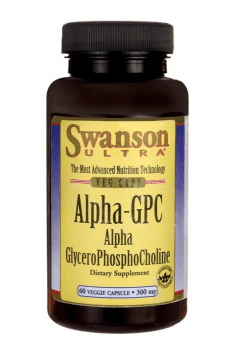 Recent research results estimate the dosage that increases growth hormone secretion to be 600-1000 mg. Beginners in alpha-GPC supplementation should start with a smaller dose. Patented extract from grapes and blueberries (! ); high concentration of bioavailable flavonoids. Popular supplement in the treatment of arthritis. Works anti-inflammatory for joints and muscles. Lozenges containing the inner bark of the slippery elm. Neutralizes throat irritation.